Vítejte v Praze! — Welcome to Prague! Thousands of NC State students have heard this phrase since they started venturing to the city on faculty-led programs in 1991. The NC State European Center in Prague opened in 2005, and last year the center moved to a new facility, expanding its commitment to provide opportunities to study and conduct research abroad. Now even more faculty, staff and students enjoy the university’s gateway to a rich, global education. 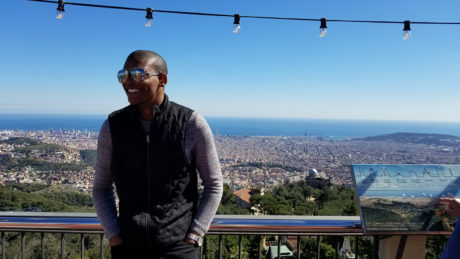 What started with the College of Design offering summer programs now includes a host of study abroad experiences for the entire university community, under the umbrella of the Office of Global Engagement. In the year since its grand reopening, NC State Prague continues to grow the world-class academic reputation of NC State. 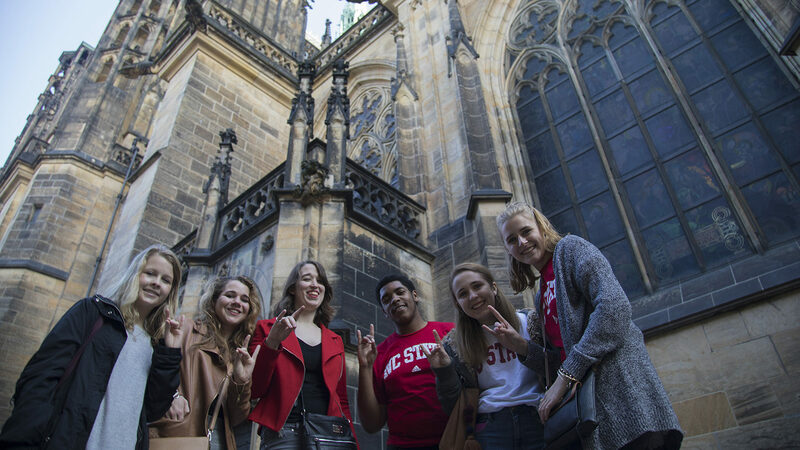 More than 200 students experienced Prague in the 2017-2018 academic year. The city’s blend of old-world charm and modern European culture sets the stage for a formative life experience. The classic summer program represents one of several unique programs experiencing recent growth. 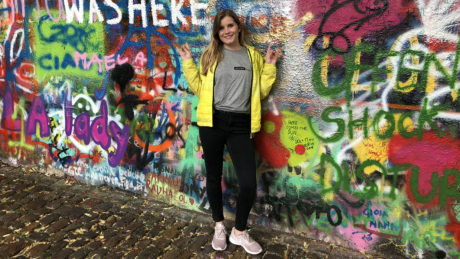 Prague Connection and First Year Inquiry both give first-year students a chance to study abroad and earn course credits before ever taking a class on campus. The Prague Connection program — a fall semester program for first-year students admitted for the spring semester — grew to nearly 30 participants this year. In August, more than 35 first-year students spent two weeks exploring the city’s history and culture prior to the start of the fall semester. Students traditionally engage in academic offerings that include courses on protest, dissent and change — a nod to Prague’s history of activism; history focused on the origins of modern Europe; and Czech language and culture. Soon, they’ll enjoy enjoy even more academic options, including several STEM-focused courses. NC State Prague aims to work with local Czech university faculty to teach these courses. Of course, classes represent just one facet of Prague’s overall appeal. Students enjoy a multi-sensory experience in the ‘the mother of all cities’ through sampling local cuisine, twelve centuries of architectural excellence, picture-perfect scenery along the Vltava River, contemporary and traditional art, music and more. Faculty wishing to teach at NC State Prague may propose ideas for new courses or to bring existing NC State courses into the Prague curriculum. Tom Koch, associate director of the Department of Music, taught a STEM and liberal studies program in London, and felt students should get to explore a similar offering in one of Central Europe’s leading capitals. Over Maymester 2018, he took nine students to Prague and Vienna in a course he created — The Music and Arts of Prague and Vienna — which covered the music and arts of the two cities from social and cultural perspectives. Koch helped enrich the students’ experience through diving into classical and popular traditions in Czech music, architecture, painting, film, dance and theater. Later in the first summer sessions of this year, Cheryl Cass, teaching associate professor and the Department of Materials Science and Engineering’s director of undergraduate programs, took 14 rising sophomore engineering students to Prague. She taught Engineering in the 21st Century, which she created to integrate the engineering landscape in the Czech Republic into the traditional NC State Prague curriculum. Due to NC State Prague’s expansion, faculty like Koch and Cass, and staff will enjoy even more opportunities to teach and conduct research in one of Europe’s most historic cities. They will also have the ability to host symposiums, conferences and workshops in the new facilities. The Office of Global Engagement hosts a number of campus events to celebrate International Education Month in November. NC State Prague plans to build on the successes of the past year with several changes to better serve those who research and study there. A new director will start in early 2019 and will begin creating a new framework to support NC State Prague in the future. A new student affairs program coordinator will help students more intensely engage with the local Czech culture and community. Additionally, new courses will be coming to the Prague curriculum. These include general microbiology in fall 2019, and a computer science course this summer, where NC State faculty will co-teach with faculty from Charles University. can I go along ?